The power of the Taos landscape at first overwhelmed Bisttram. 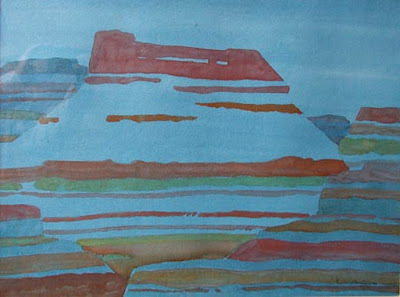 "Whenever I tried to paint what was before me I was frustrated by the grandeur of the scenery and the limitless space. Above all a strange, almost mystic quality of light." 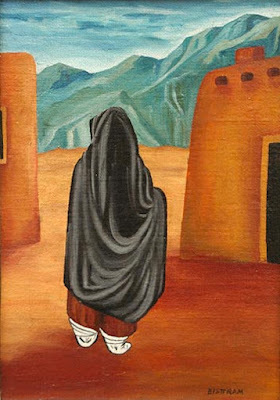 Bisttram studied under muralist Diego Rivera and in 1938 started the Transcendental Painting Group. The intention was to "carry painting beyond the appearance of the physical world." April 7th is "Emil Bisttram Day," a New Mexico state holiday. and thereby bring it to envision and experience wider horizons. . . . an experience on a higher plane of emotion and intellectual perception without which there can be no real progress in man's development." Parsons does not offer Emil Bisttram prints, because no print can compare to the real paintings. Emil Bisttram art works include: “Oversoul,” “Pueblo Woman,” “The Chief,” “Kachinas,” and “Medicine Man”. In 1895 Bisttram was born in Hungary close to the Romanian border . He was raised in New York City, after his family immigrated there when he was 11. He studied at the National Academy of Art and Design, Cooper Union Art School, Cooper School of Design, Parsons, the Art Students League, the New York School of Fine and Applied Art, Chase School, The New School for Design, Roerich Academy and also with Mexican muralist, Diego Rivera. Bisttram's teachers included: Ivan Olinsky, Leon Kroll, Howard Giles, Jay Hambidge, and Diego Rivera. 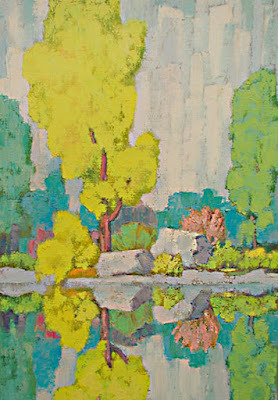 Wassily Kandinsky and Nicholas Roerich were his greatest influences. In 1919, Bisttram was married to his wife, Mayrion. He started teaching soon after his finishing his schooling. He taught at the New York School of Fine and Applied Arts, and then at the Master Institute of the Roerich Museum, and later at the New York School of Fine and Applied Art, Parson's School of Design, and at the Master Institute of the Roerich Museum in New York. At 21 years old, he started Americas first freelance advertising art agency. 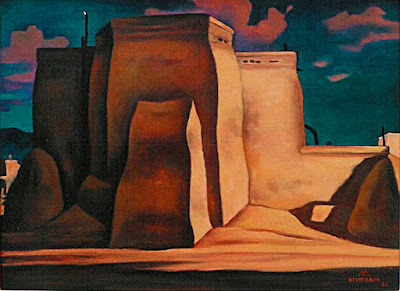 In 1930 he made his first visit to Taos, New Mexico. In 1931 he was awarded a Guggenheim fellowship to study mural painting in Mexico under Diego Rivera. In 1931, he taught in Phoenix for a short while, then returned to settle in Taos, where his wife was waiting for him. 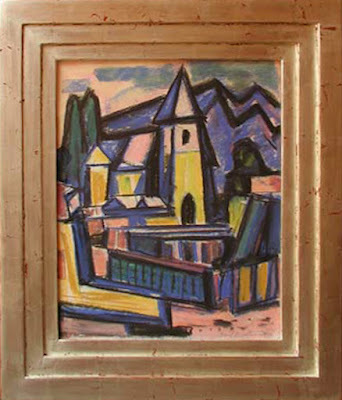 In 1932, Bisttram founded the Taos School of Art, which later became the Bisttram School of Fine Art. In 1932, to perfect his portrait of a "Indian Girl with Basket," he first built some of the elements in wood and clay. 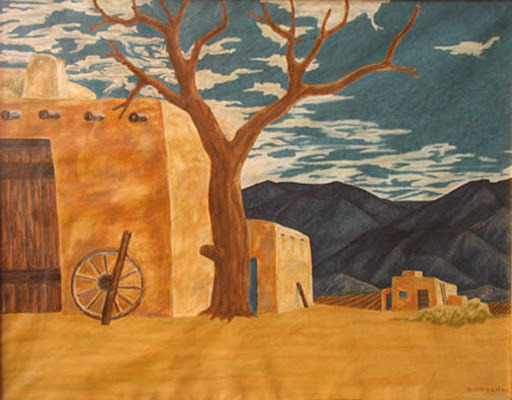 He completed murals for the Department of Justice in Washington D.C., The Taos County Courthouse, New Mexico, and the Federal Courthouse in Roswell, New Mexico. 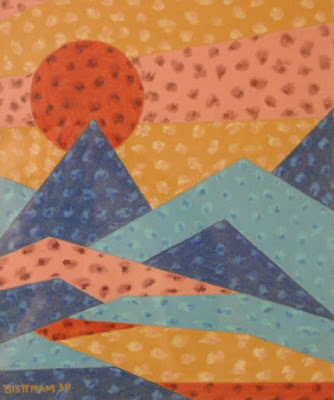 In 1938 Bisttram was a founder of the Transcendental Painting Group, with Raymond Jonson and seven other artists. During World War II, Bisttram moved his school to Los Angeles, to better serve artists in the armed forces and defense industries. Summer sessions were held in Taos, New Mexico. 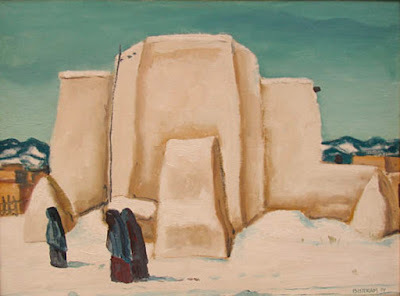 In 1952 he help start the Taos Art Association. In 1959 he was awarded the Grand Prize for his painting at the New Mexico State Fair. In 1970, Emil Bisttram was judge and monitor for art for the Taos County Courthouse building. Bistram was still painting vigorously in 1974. In 1975, April 7, his birthday, "Emil Bisttram Day," was declared a New Mexico state holiday. He died in New Mexico in 1976, after a prolonged battle with cancer.